A stopped watch is right at least twice a day, right? Let's not get into analog or digital (though it is a great song). Maybe Marissa needed that 4 years of extra seasoning but regardless I think she's exactly what Yahoo needs. Enough big company internet experience mixed with just enough technical chops to keep a technology company focused on of all things, technology. Good luck to her and hopefully she gets someone to fix all the bugs in the My Yahoo product. I was just looking at LinkedIn's stock price today and something stood out. Not the $81+ current stock price but the P/E ratio of 1,217.61. That's correct 1,217.61. For some perspective, Yahoo! (which is struggling) has a P/E ratio of 19.45. Google, which is still on a roll but not the darling it once was has a P/E ratio of 20.54. 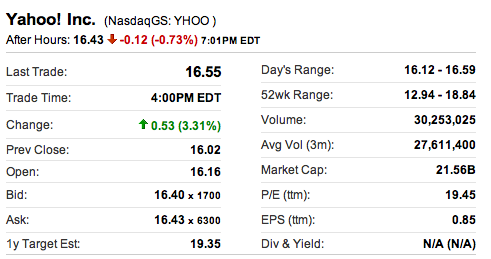 You can argue that a hot company liked LinkedIn versus Yahoo! is not contest. However, versus Google? Not so much. For the record, I'm not a stock guy. There are probably some nuances to the P/E ratio that don't tell the full story, etc. Also, I really like LinkedIn as a service. It's invaluable to me as a networking, recruiting, prospecting tool. But to give you some perspective, I've spent tens of thousands of dollars a month advertising on both Yahoo! and Google, each. Again, that's PER MONTH. Since LinkedIn has been in existence, I think I've spent a total of less than $500. Again, I may be atypical and maybe I'm an old fart and not with it like the cool kids who grew up on social media but it's hard for me to understand that valuation. I sincerely hope they grow into it and continue being successful. Is a phone really that important? 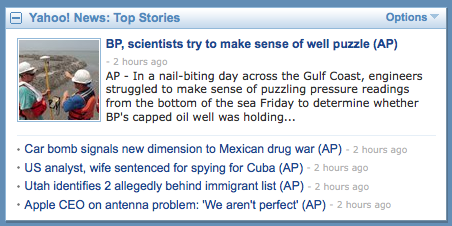 This is the Top News Stories section from My Yahoo start page. The first 4 stories seem quite appropriate for this section. These are important news stories that have real life altering impact to many people. The 5th story is just absurd. Honestly people, it's just a damn phone. People are dying in the world and the Gulf of Mexico is a disaster zone. Those are important stories. Whether a phone loses cellular signal just doesn't really seem that important in the grand scheme of things. Granted, Apple brings a lot of this upon themselves with the way they handle PR but I would hope that the powers that be that shape and deliver our news would have elected to push a story like this to Page 2. But in the ever growing chase for eyeballs, news outlets want to push what brings in the most readers. Who cares that only 3 million iPhone 4's have been sold versus the hundreds of millions of other phones on the market. There's only one thing that people love more than fawning over winners and that's to watch them fall. For the record, I own an iPhone 4. Haven't had any issues with it - antenna related or otherwise. The damn thing does slip out of my hand more often than the previous model so I'm happy to cash in on my free case courtesy of Steve Jobs. If the outcome of all the hoopla is that I get free stuff, so be it. I just think we all need to gain a little perspective of what's truly newsworthy.